“It was far too dangerous for Burroughs himself to score in the battle zone of Alphabet City (avenues A,B, and C), so that Stew and other friends attended to that. Jim Prince, a boyish twenty-five year old would-be writer who had become a Bunker regular, was sent out on numerous missions…. Although he’s best remembered for having written Naked Lunch in the “interzone” city of Tangier, William Burroughs spent two of the most important periods of his long life in New York. First, he lived there in the early to mid ’40s, where he met Jack Kerouac, Allen Ginsberg, Gregory Corso, and the other writers and artists who would coalesce into the Beat Generation. 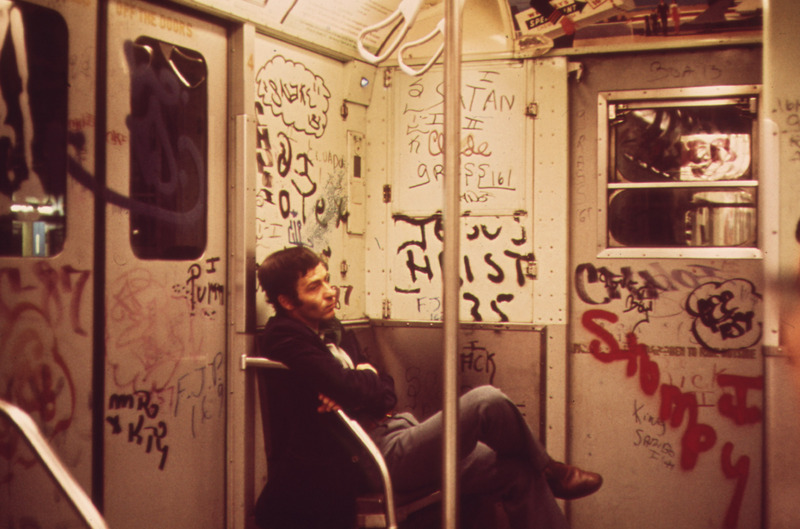 New York was also the place where Burroughs first became addicted to heroin, being introduced to it by some of the Times Square hustlers and criminals that he hung around with. His name would be synonymous with heroin for the rest of his life. Burroughs (left) in New York in 1953. He left New York, first for Texas and Louisiana, where Kerouac portrayed him as “Old Bull Lee” in On the Road, and then for other countries, traveling throughout South America, the Middle East, and Europe for a quarter century. He came back to New York in 1974, and took up residence in an old former YMCA building, which Burroughs came to call The Bunker. The Bunker, as seen in Howard Brookner’s 1983 film Burroughs. There were no windows in The Bunker, so Burroughs painted the whole place white from floor to ceiling, to give some semblance of light. He set up his desk and typewriter, and for the next half dozen years, had one of the most productive periods of his entire career. He also became something of a celebrity in the New York scene of the time, with The Bunker regularly hosting gatherings of artists, writers, and musicians like Andy Warhol, Jean-Michel Basquiat, Deborah Harry, Mick Jagger, Terry Southern, and old Burroughs friends like Allen Ginsberg. Journalist Victor Bockris recorded a lot of these gatherings, as well as interviews with Burroughs, and published them in book form as With William Burroughs: A Report From the Bunker in 1981. It’s still probably the best portrait of Burroughs at this time, as well as a fascinating insider’s view of the New York art scene of the late ’70s. Filmmaker Jim Jarmusch remembers renting movie cameras from a little shop in the same place, having to move past the lines of junkies to get his equipment. Jarmusch was the sound recordist for the first feature length documentary about Burroughs, done by Howard Brookner in 1983. That film, recently restored and rereleased as part of the Criterion Collection, is a fascinating portrait of Burroughs’ life during his time in New York. It ends with Burroughs moving to Lawrence, Kansas, where he would spend the rest of his life until his death in 1997 at age 83. Though he was the oldest of the Beat writers, he managed to outlive all of them, in spite of his heavy drug use for most of his life. On a personal note, I can recall learning of Burroughs’ death in the summer of 1997, and raising a glass to Old Bull Lee aka Dr. Benway with another of the future founders of Mean Street Cinema, in a backyard somewhere in the mythic midwest. Although I never much liked Burroughs’ experimental novels, he was nonetheless an erudite and original thinker, with an amazing spoken word voice. That he was hanging out in NYC at the same time that punk and hip hop and No Wave and the downtown art scene were happening just makes him that much cooler.